For several months, Quick Heal Security Labs has been observing an increase in ransomware which are built in .NET framework. Ransomware like SamSam, Lime and now Shrug was found to be built in .NET framework. 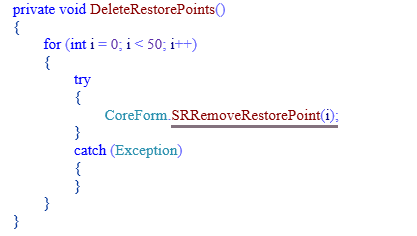 Malware authors are finding it very easy to build and obfuscate malware in .NET framework rather than making them in other compilers. 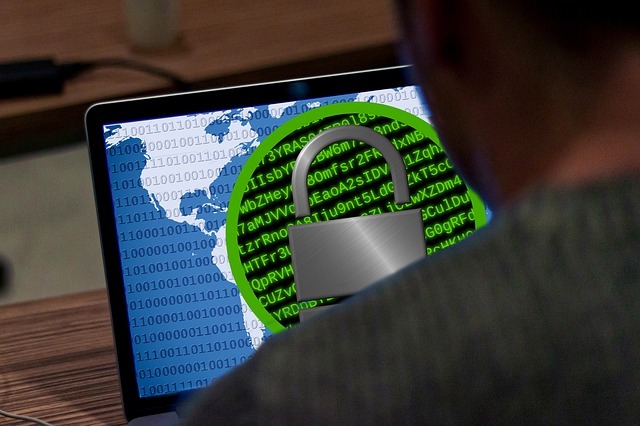 Quick Heal Security Labs has found a new ransomware named Shrug2. 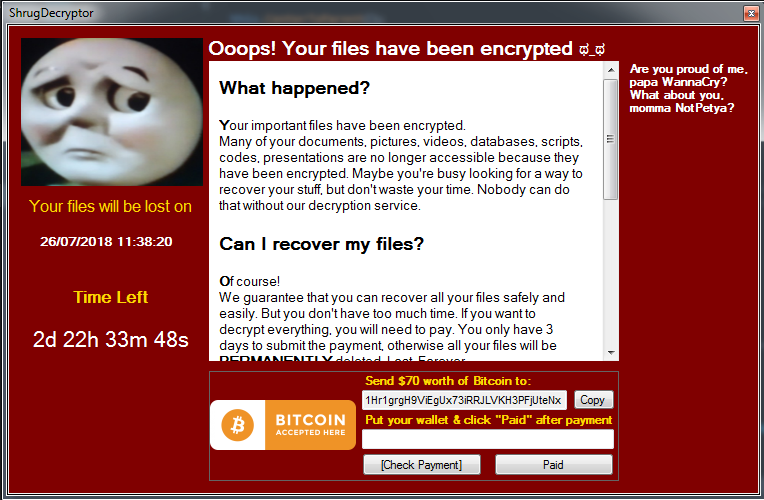 This ransomware demands a ransom of 70$ in the form of Bitcoin for decrypting files. The infection vector of this ransomware is still unknown, but this file may arrive on the victim’s machine via phishing emails, RDP brute force attacks, malvertising, bundled with other files, etc. 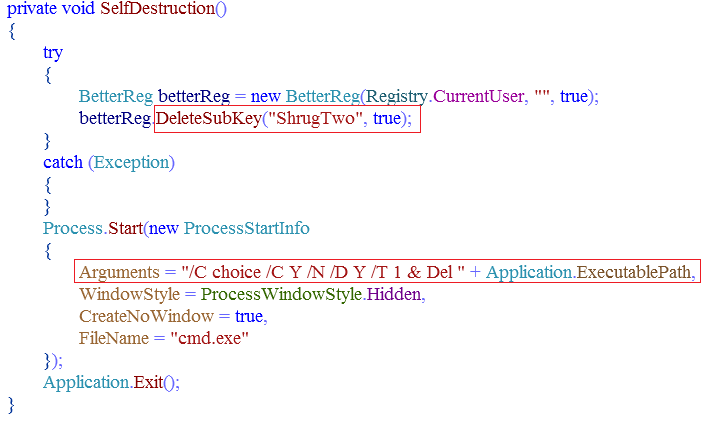 If the system is not infected, then it creates a subkey with name “ShrugTwo” under HKCU and adds respective values to it as shown in Fig 3. Installdate: Date and time when the ransomware infects the victim’s system. This date and time is used by the ransomware to display the time left to decrypt the files as shown in Fig 15.
cryKey: Randomly generated AES256 bit key used to encrypt files. cryIV : Randomly generated Initialization Vector used to encrypt files. After this, malware executes below command to grant all permissions to directory and sub-directories present in %CD%. This command was also seen to have been used by the WannaCry ransomware. The ransomware enumerates all files with the above extensions present in C:\\ drive only and stores them in a list named “FilesToHarm”. This list is later used for file encryption. A similar kind of list is also created with the name “HarmedFiles” which contains file paths of encrypted files having the extension “.SHRUG2”, when the demanded ransom amount is paid or time to decrypt files is elapsed. 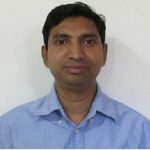 This created list is used for file decryption or deletion. This Ransomware uses AES256 algorithm in CBC(Cipher Block Chaining) mode for encrypting enumerated files. In this type of mode, there is a requirement of Key along with the Initialization Vector(IV). 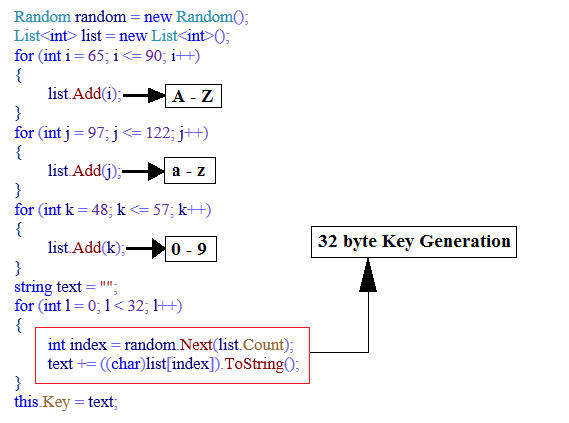 The code shown in Fig: 10 is used to create below list and randomly selects 32 characters from it which is used as AES 256bit key. 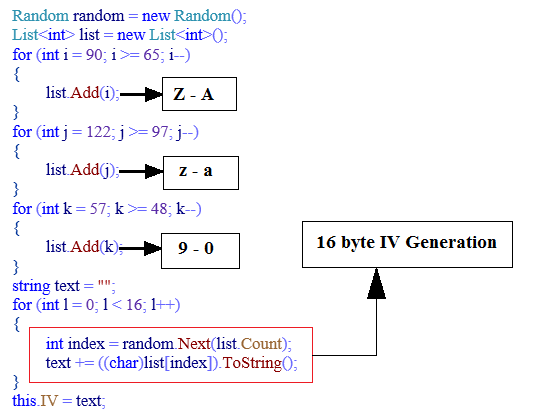 Similarly, code shown in Fig: 11 is used to create below list and randomly selects 16 characters from it which is used as AES 128bit IV. Previously generated Key and IV are used to encrypt file paths present in “FilesToHarm” list. 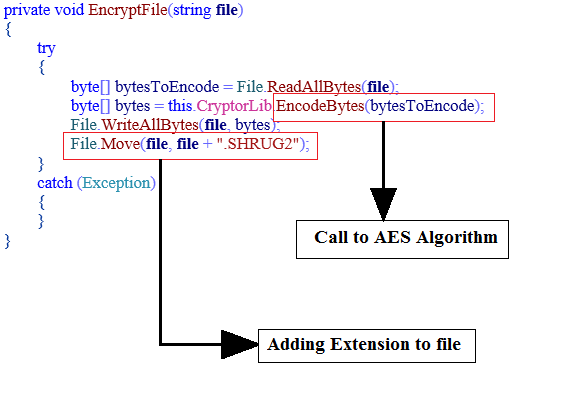 Ransomware adds “.SHRUG2” extension to files after encryption. To encrypt files, the ransomware selects file data in chunks of 128bit. This chunk of data is encrypted using previously generated Key and IV in CBC mode. Once all files present in list “FilesToHarm” are encrypted, this ransomware sends all generated information like Identifier, Installdate, cryKey, and cryIV to below CnC URL which is present in the file. Then, the ransomware creates its shortcut on the desktop with the name “@ShrugDecryptor@”. Name to this shortcut is given in order to fool the victim. After creating a shortcut, it shows below ransom note, it contains time left to decrypt files along with bitcoin wallet address of ransomware author. Along with file encryption, the ransomware can perform other activities like file decryption and file deletion. Files are decrypted after ransom amount in form of Bitcoin is paid to malware author at wallet address “1Hr1grgH9ViEgUx73iRRJLVKH3PFjUteNx”. If ransom amount is not paid within a specified time duration, all encrypted files are deleted. After successful deletion of an encrypted file, this ransomware also deletes all its traces. DeleteSubKey deletes Registry “HKCU\ShrugTwo” and then creates a process to delete itself.